Artist and teacher Kiko Denzer shares his thoughts on spoons, and so much more. Everybody eats, everybody uses a spoon. Many people have favorite spoons. What makes one spoon different than the rest? Why does he like this one, and she like that one? A handmade wooden spoon from Haiti. An offhand comment? Perhaps, but it means so much: “our favorite spoon” says (to me) “our most valuable spoon.” Where does such value come from? Does it come from a famous name artist? A sky-high price tag? Exceptional rarity? NO! In fact, it comes from exactly the opposites of those things: it’s cheap and common — just another spoon in an import store, hand-made, yes, but by an anonymous person just trying to make a living — someone probably more like us than different. Second, it’s useful for everything; it doesn’t just hang on the wall. And everyone likes it. It was a completely spontaneous comment about what constitutes value, which is not dollars, but love, longevity, and connection. These are the roots of culture. So a spoon begins with a tree, and the tree takes us back into a garden that we share with all creation. Charlene and Kiko at the spoon carving class. Richard and I first met Kiko at an earth oven workshop he was leading in the Corvallis area 12 years ago. A year after that, Kiko led a Slow Food Workshop here at Nana Cardoon, where we built our earth oven. Since then Kiko and I usually attend The Grain Gathering Conference, held annually at the Mount Vernon Extension of WSU. It was there we started talking about presenting a spoon carving class here on the farm as part of our focus on traditional and artisan cooking tools. Kiko is an artist above all, in philosophy, in sculpture, and in how he lives life. We have enjoyed being with him and his family on several occasions. He is a treasure on so many levels, and the opportunity to work with him personally is a true gift. This spring eleven students enjoyed a day of hands-on learning at Nana Cardoon. Check out their journey from beginning with an applewood log, to ending with their own wooden spoon. With hatchets ready, logs neatly piled, and examples of the spoon in various stages of making, artist and instructor Kiko Denzer explains the process and craft of designing and making a wooden spoon. Each spoon begins with finding the perfect log, and getting it to the right length, too! Working together to split the log. Kiko demonstrates the many stages of spoon making, from the shape of a spoon to how each tool is used. 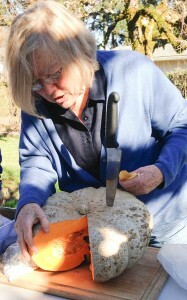 Students use hatchets and knifes to begin carving out the spoon shape. Yes, that’s a cow with real cream. What else comes with a coffee break? The class doesn’t bother the local resident birds. This bird continues to feed its young just a few feet above all the action. Mid-day break happens over a farm-fresh lunch. Everyone enjoys just-picked greens, farm-grown polenta, cardoons in a tomato sauce, farm-made cheeses, and the first strawberries of the season topped with Charlene’s own kefir-fermented creme fraiche for dessert. More instruction, more carving – and the afternoon passes quickly. “I didn’t believe I’d really make a spoon out of that log today,” a student states. Yet everyone crafts a beautiful and unique wooden spoon to take home. 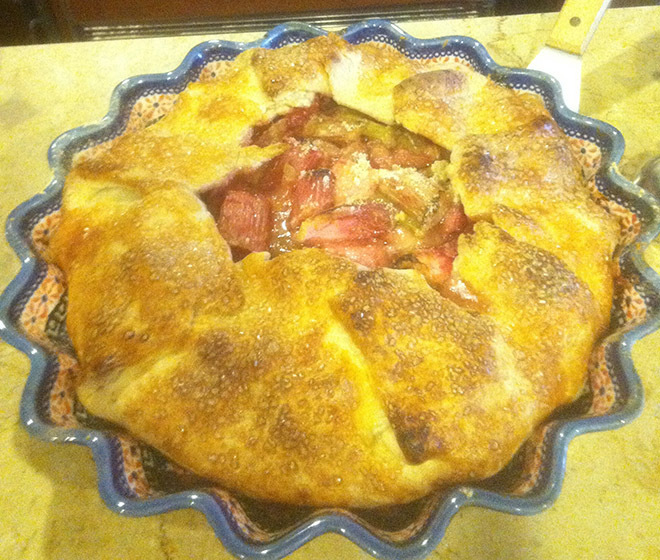 One of the first signs of Spring’s awakening at Nana Cardoon is rhubarb. An herbaceous perennial vegetable native to Siberia it makes its appearance in the early months of the year, typically March. We “force” our rhubarb, that is we place an earthen pot called a cloche (reminiscent of the closely fitting woman’s hat) over the barely emerging plant. 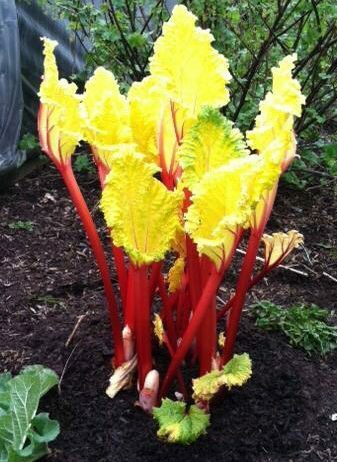 Our cloches are from England where there is a long standing culture, even celebration of forced rhubarb. The Rhubarb Triangle including the towns of Wakefield, Leeds and Morley are home to several events. wikipedia.org/wiki/rhubarb-triangle has a fun and fascinating posting titled, “History, Cultivation and Culture”. 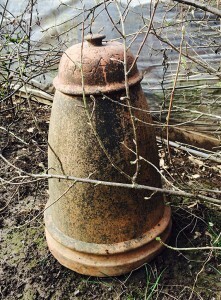 The function of the cloche can be improvised with a large terra cotta pot and a stone or piece of broken pot to cover the hole. Not as pretty but does the job! grows tall and tender as it reaches for the light. 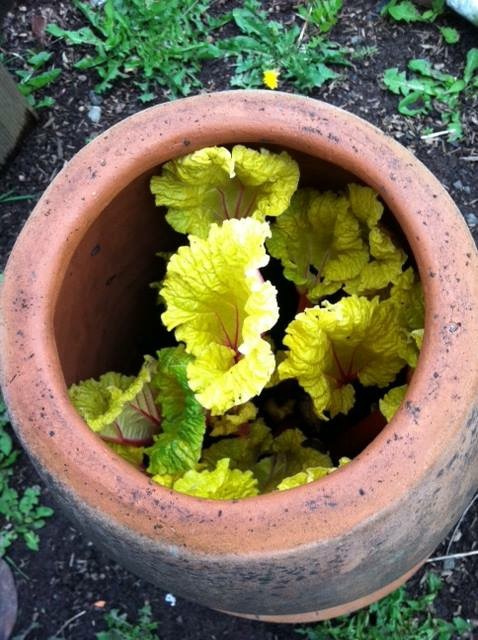 Once the leaves reach the top of the cloche the pot is removed to reveal the most amazing array of colors depending upon the variety, combinations of “hot” lime green, rosy red and pink. Richard prefers to use a mixture of red and green stalk varieties. The red stalk varieties are flavorful, yet mild, while the green stalk varieties have a more complex flavor for the pie. It’s become an annual event here: friends gather for the unveiling. We herald with a hearty “Da! Da! Da! Dat! Da!”, followed by exclamations of joy as the colors are revealed. Each fall our plants are given a one-inch dose of compost and mulched with several inches of decaying leaves. A caution is in order. The leaves are high in oxalic acid, therefore somewhat toxic and not to be eaten. We always make something special from these beautiful stalks (petioles). Recipes, both sweet and savory abound. Above is a picture of one of Richard’s famous pies. There is always a secret ingredient, an intriguing accent: crystalized ginger in rhubarb, almond extract in cherry, freshly cracked pepper in strawberry, aged balsamic in apple. We cannot tell you any of the others, or we’d be revealing all his secrets! We follow British chef and food activist Hugh Fearnley-Wittingstall, www.rivercottage.net and use his recipes quite often. 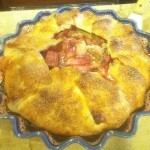 Here’s a recipe from The Guardian, ” Pretty in Pink: Hugh Fearnley-Wittingstall New Season Forced Rhubarb Recipes”. The recipes range from savory to sweet. We chose the rhubarb and rosewater to illustrate the beauty of simplicity, just enough sugar to lift the rhubarb and enough drops of rosewater to enhance the floral notes. It only needs a shortbread cookie to accompany. Delicate, delightful ode to Spring! Slice rhubarb into pieces and place in a baking dish with just the water that clings to it after washing, and toss with sugar. Cover with foil and bake for 30-40 minutes, until tender. Cool completely then gently stir in the rosewater, starting with just 1/2 teaspoon, adding a little more at a time until you have the depth of flavor that suits you. Serve with your favorite shortbread cookie. Rosewater brings out the slightly floral quality of new season forced rhubarb, but if that isn’t your think, use orange flower water or a few drops of best-quality vanilla extract. Maria, highly respected island cook and cooking teacher, Zakynthos, Greece, prepares her Hortopita for the oven in the photo above. The hot sunny days of summer, the crowded beaches, and a multitude of tourists become fading memories by the beginning of November on the island of Zakynthos. The wine grapes have been harvested and the Zante currants have been collected from the drying flats some time ago. The olive harvest is in full swing and so is the rainy season. A carpet of weeds covered the dry, parched earth soon after the first rains. The sheep and goats are not the only ones delighted with the lush new growth. 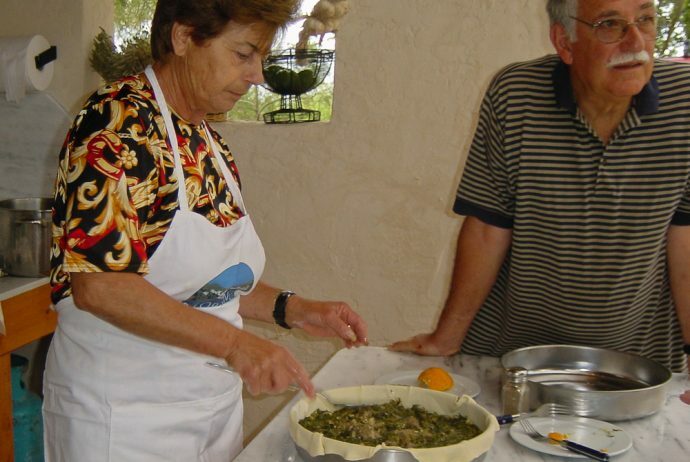 People are also foraging for their favorite weeds known as horta all over Greece. (You’ll recognize the word in the term horticulture). When I moved to the island a dozen years ago I soon discovered the gift of the first rains, “the wild greens”, euphemism for weeds, at our friend Maria’s table. I went along on the next horta gathering trip. Armed with a short, sharp knife and toting a big plastic bag we walked into the hills behind the village. I soon learned to recognize the dozen or so weeds we were after. It turns out that most of them are varieties of dandelions (cichorium), endives are a domesticated version. Maria was very amused when I told her of the never-ending efforts expended in U.S. suburbia to eliminate them from manicured lawns. “Why don’t you just eat them?”, she said. In addition to the prolific dandelions we collected tender young mustard greens, wild fennel, wild garlic and leeks and a very aromatic parsley-like plant called caucaljda. In less than half an hour we had more than enough for a couple of meals. The mix of weeds changes over the rainy months as new varieties replace earlier ones gone to seed. Many of the more aromatic plants come along in January and February. The flavor and the texture keeps changing. The most common preparation is to simply boil the greens for 5 to 10 minutes until they are just tender and to serve them warm with plenty of lemon juice and olive oil. This is the season for the first ripening of lemons and newly pressed olive oil so the timing is perfect. It is impossible to describe the complexity of flavors that comes from the bitter greens and the sharpness of the young oil and the aromas of just picked lemons. But my favorite dish is the pie, pita, made with a filling of stir-fried horta and feta cheese. It is a winter favorite and, as you can imagine, every pie is different reflecting the weeds used in the filling. The following is Maria’s recipe based on my observations in her kitchen, she never measures, “she just knows” how much. Combine the flour and salt in a bowl making a well in the center. Add the water, oil and lemon juice and mix to form a soft dough. Knead the dough for about 10 minutes, cover it with a tea towel and let it rest for at least an hour. Heat the oil in a pan and sauté the onions taking care not to brown. Add the greens and stir-fry until wilted, 7 to 10 minutes. Set aside and let cool. Crumble the feta and add to the greens, mix well. Shape the dough in to a ball and in two. 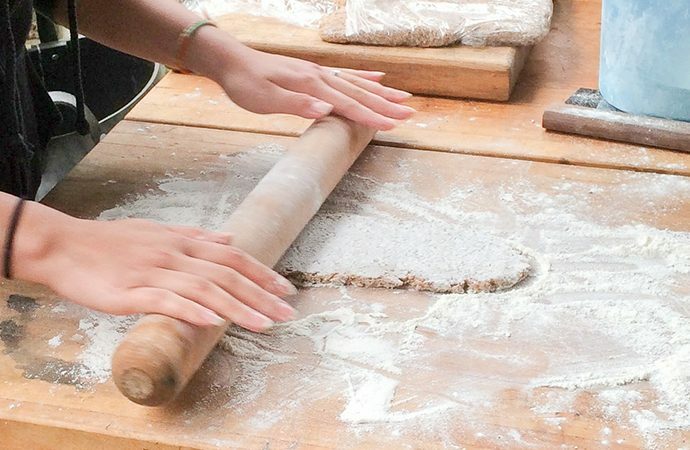 Sprinkle a small amount of flour on your work surface and roll out one half into a 16-inch round. Brush olive oil on the pan and spread the phyllo round on the bottom. Place the filling in the pan. Roll out the second portion of the dough, place it on top of the pan and pinch the edges together. Brush the top surface with olive oil and prick with a fork to allow venting. Bake for 45 minutes to one hour. The top surface should be golden brown. Allow the pie to cool for at least 15 minutes before attempting to cut and serve. When we read Sotiri’s evocative copy regarding the gathering and preparation of wild greens we were intrigued to learn the derivation of the English word “horticulture”. We replied to his posting. He indulged us with more research. 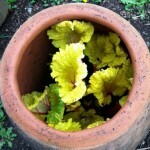 It all started with the Greek “horto/horta” thousands of years ago. The word “Horta” is derived from the word “Hortos” used in an early version of the Greek language about 4,000 years ago. It meant an enclosed place of land usually used to grow things. It evolved from the earlier, about 5,000 years ago, Indo-European language term “Ghortos” which also mean an enclosed place intended to grow things. The term found its way into other Indo-European languages, “hortus” in Latin, “gortum” in Frygian (Anatolia, now Turkey), “garten” in German, “jardin” in French and, of course, “garden” in English. It was also a precursor for “court”, another enclosed space. In Greek what grew in a “hortos” is “horta”. In modern Greek “horta” is in use meaning greens/vegetables, but not “hortos”. They also make the distinction calling the “horta” gathered in the wild “wild greens”. The term must have originated at the time that the hunter-gatherers turned into farmers and had to protect their crops from animals and perhaps the neighbors. What does Seedy Saturday at Nana Cardoon look and sound like? A dynamic group of folks happily exchanging seed stories, history, culture, culinary usage, and growing tips. Beautiful brown seeds so tiny they could blow away, shiny black seeds large enough to reflect the sun, brittle dried pods and leaves suspended from vines filling a large bag, small neat packets displaying names like Frye’s Golden Goose and Black Star Lima … all these and more just waiting for a new garden or farm to grow in! Getting ready for Seedy Saturday. The inspiration for Seedy Saturday came from several trips to Sooke Harbour House to celebrate our anniversary. Owner Sinclair Phillip is very active in Slow Food Canada, and extends a special discount to Slow Food members. 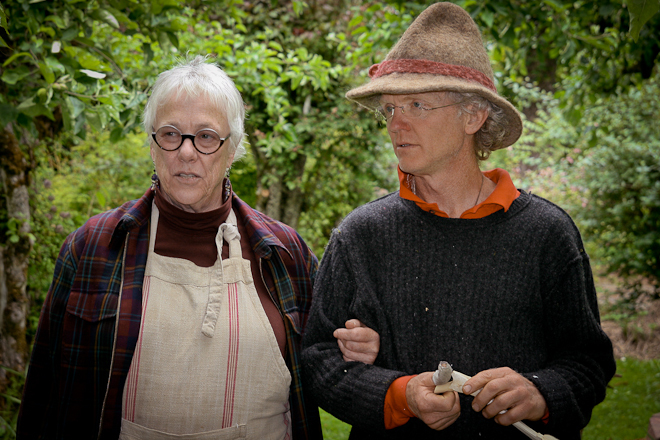 The cuisine at Sooke Harbour House is overseen by Sinclair and his wife Frederique, and is dedicated to local, organic, seasonal and wild foods. All items on the menus are from the Southwestern Coast of Vancouver Island. Started in 1990 in Vancouver, British Columbia, there are now over 100 Seedy Saturdays throughout Canada and they are spreading throughout the world. The event began as a response to the difficulty, at that time, to find heritage varieties of vegetables, fruits, flowers and grains. What really impressed us about the Sooke event was that each of the seed companies there were represented by owners and representatives who knew the history of all the seeds they were offering. It has always been important to us to know the back-story of any seed source we might consider for the gardens and fields at Nana Cardoon, and this event provided a rich source of information in that area. This popular Canadian event prompted us to begin an annual Seedy Saturday at Nana Cardoon, with the exchange to be held on the 3rd or 4th Saturday of February. For our event we planned to invite and share special seeds and stories from seed savers in our community and region. Our goals are to share seeds that have a definite known history of where they have been planted, how they have been harvested, and the care that was taken with cross pollination issues. With the focus on seed history, this is how Seedy Saturday differs from a simple seed exchange. 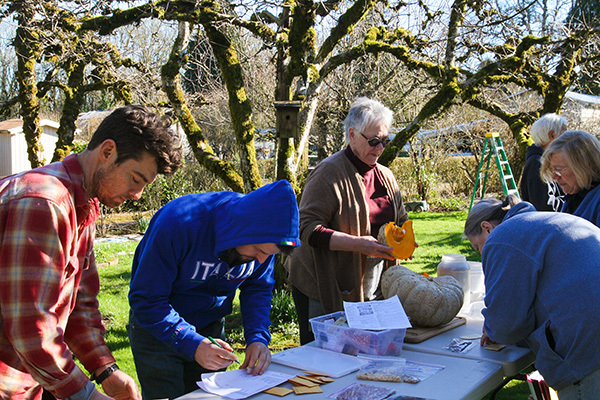 Our second annual Seedy Saturday, held on February 21, 2015 coincided with a Slow Food Ark of Taste Oregon Committee meeting held here. The committee members enjoyed the fire pit setting for their meeting and a tasty luncheon at the outdoor table. Then the committee members were eager to meet other seed savers from the community after lunch and begin the afternoon Seedy Saturday event. Under a cloudless bright blue sky stories were told and seeds exchanged. Interest was high and intense as one after another the history of the seeds unfolded. Locations of plantings, textures of vegetables, and where the seed originated spilled out along with the seeds. There were surprises, too. One member of the Ark Committee brought very special pepper seeds–much to the surprise of another member, who operates a well-known Seed Company, and who believed she had lost the seed source of the pepper! Lupini Bean. These seeds sprouted can reach 40% protein. Tom Thumb Popcorn. Popular with children, the small cobs can be popped quickly in the microwave. Otto File Polenta Corn. This corn has been naturalized for our growing season for 12 years. You haven’t eaten polenta in you haven’t grown & ground your own. Black Star Pole Lima Bean. This, beautiful, smallish pole lima bean doesn’t loose its dark color when cooked. Tennessee Squash. A fabulous, sweet large squash propagated locally for over 30 years. Oregon Homestead Sweet Meat Squash. This seed heritage in nurtured by Dr. Carole Deppe. Yellow Cabbage Collards. During the sub freezing weather locally, these collards kept on going. Frye’s Golden Goose Pole Bean. This is a local (Gales Creek) heirloom bean seed purportedly from a goose’s crop. Makah Ozette Potato. Large fingerling shaped potatoes from the Makah Indian tribe near Ozette, Washington. This potato is on the Ark of Taste. Ravanello Candela di Fuoco. Fire red, candle shaped radish from Italy. This particular radish goes to seed vey quickly locally, and is a prolific producer of very tasty, crunchy, slightly spicy pods. Zolfini Beans. Naturalized locally for over 20 years. Bean seed originally from the Consorium Fagioli Zolfini del Prato Magno. Prolific bush variety. It was a very grand Seedy Saturday! 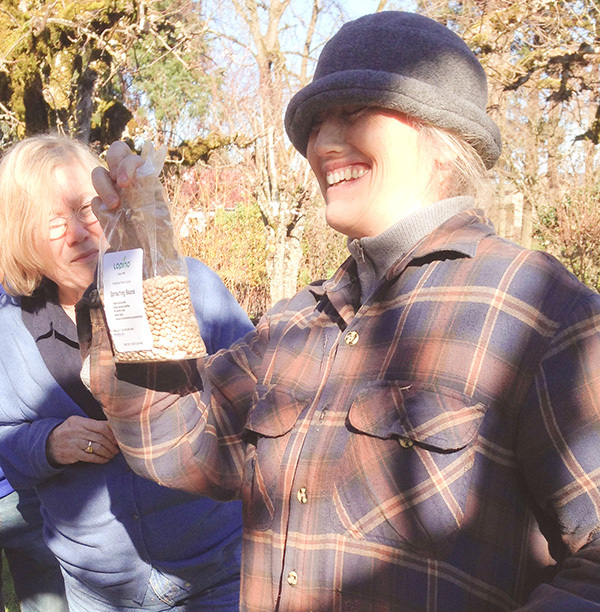 One of the goals of future Seedy Saturdays at Nana Cardoon is to gather seed savers and their stories, and share and swap seeds with the intent of participants specializing in a crop or crops. In October, the same group would gather to barter and trade surplus and abundance. This specialization in growing would place heirloom squash in one person’s care, keeper onions in another’s, potato varieties in another’s. This annual event might be called Winter Larder Exchange. Ideas for seed exchanges, and the sharing of growing seeds and information are endless! At Nana Cardoon we work for seed sovereignty, for supporting open pollination and heritage seeds, and for putting good seeds into the hands of farmers and gardeners to grow, eat and share long into the future. Written by Charlene and Richard. While attending a cooking school at Tenuta di Cappezzana near Florence, Italy over twenty years ago we discovered for ourselves puntarelle and other chicories, cardi (cardoon), and other garden vegetables and began propagating them in our garden. The cardoon soon had our full attention. Sometimes referred to as “high maintenance”, we revere the processes associated with cultivation and preparation of the cardoon. In our search for cardoon seeds, we searched for seed packets all over Florence. Not being fluent in Italian, we were not having any luck finding “cardi” seeds. One morning, while attending the market in the Piazza St. Spirito, across the river Arno in Florence, a nice stranger overheard our conversation at the seed store. He helped translate our request to the shop keeper…we wanted “carrrrrdi” (emphasize the trill of the “r”), not “cardi”. Success!!! Gobbi di Nizza Monferrato involves mechanically heaving up the soil in the rows of cardoon, forcing the plant to bend slightly under the soil, as it continues to reach for sunlight. This practice keeps the inner stalks tender and delicious. Cardoon grown in this manner is eaten raw in many dishes. This type of cardoon is also known as the “hunchback” cardoon, as pictured in the Nana Cardoon logo. 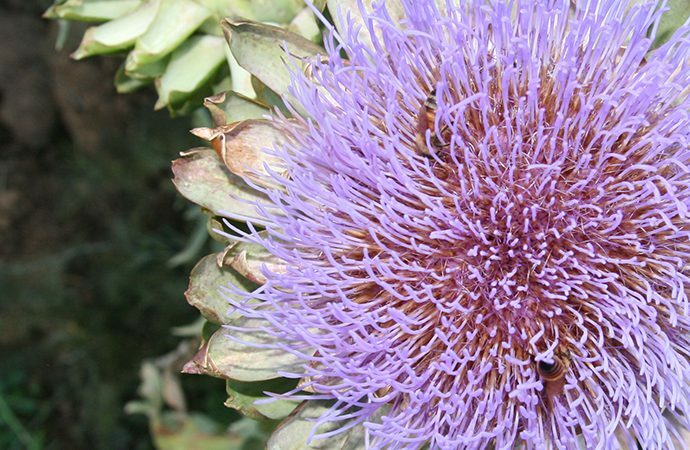 Cardoon is a very old Mediterranean vegetable…some sources quoting it as the leaf in Corinthian architecture. We are especially fond of traditional peasant dishes from Italy and France. The smallest amount of ingredients, harvested at the peak of nutrition and freshness, served simply, combine to create taste memories…something that people long to return to time and time again. One of our favorite ways of celebrating the cardoon is Bagna Cauda. Pictured below are three ingredients in the recipe we use. Our thanks to Gianluigi Peduzzi for the traditional terra cotta warmer used at table for the Bagna Cauda, and to his company, Rustichella d’Abruzzo, for the best anchovies available. 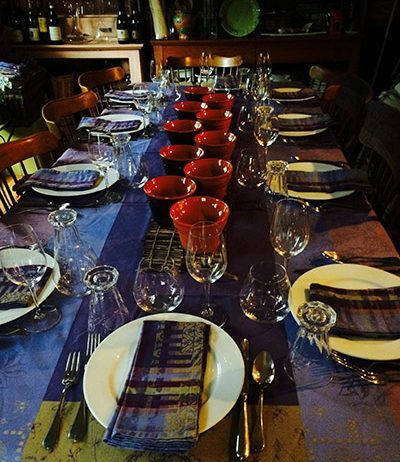 At table, for Italian fall-themed dinners, we begin with Bagna Cauda service. Each guest has their own personal warmer, into which they dip cardoon pieces, pepper slices, and other seasonal vegetable slices. The vegetable slices are dipped in the warm anchovy, garlic, olive oil mixture, and usually held over a piece of rustic bread, which is then consumed, or used to mop up the last tasty drop. In a saucepan over low heat, gently warm the olive oil with finely minced garlic and anchovies which should “melt” in to oil and will provide a wonderful flavor. This should take about 5 minutes. Don’t rush it. Remove from the heat and swirl in the butter. Pour the oil mixture in to a warmer (again, gentle please). Pass vegetables and bread slices. As your guests dip the vegetables into the flavored oil they can use the bread to catch the drips. Use a high quality extra virgin olive oil with a harvest date no older than 12 months. Your oil should taste and smell fresh, not rancid. This is a country dish often served in the fields in the fall and winter months to vineyard folks as they did the hard work of pruning. Nana Cardoon 2015 classes are open for discovery! 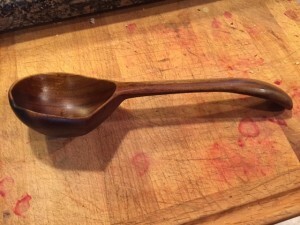 Learn how to carve your own wooden spoon. Explore the importance of water in our food. 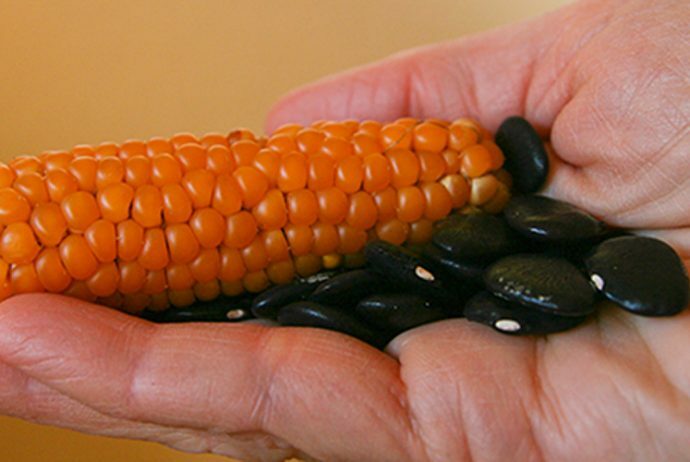 Investigate nutrient density, seed saving, homesteading , and building composts. These are just a few of the class topics in the Nana Cardoon 2015 educational series. Our instructors, working practitioners and experts in their subject, offer community members, farmers, gardeners, and teachers an in-depth experience in a wide variety of food and farming subjects. Each class offers a wealth of information through hands-on projects, presentations, and discussion. A wood-fired oven shares the classroom space and bicycles build to grind grain wait for the willing rider nearby. The long table fills with a farm fresh lunch at midday. The ever-changing orchards, rich garden beds and sown fields surround you. Check out the full list of classes, then contact Charlene to save your place in the classroom and at the table! Welcome to Nana Cardoon, an urban farm and learning center offering opportunities to explore and learn about food production, from the soil to seeds, from the field to the table. Kurdish Flatbread – baked in a brick oven! Pour water over bulgur, salt and onion. Let stand 30 min. Incorporate flour by hand. Knead 10 min on floured surface. Let stand 15 min to 3 hrs. Divide into 8 pieces. Roll out with rolling pin to desired shape, about 1/8″ thick. Transfer 2 at a time to the oven. Bake 2 minutes each side, until breads begin to brown around the edges. Cardoon House Crackers ready for the oven. Mix by hand. Let rest 7 hours, roll out until very thin ( 1/16”) on two parchment-covered baking sheets and score with tip of knife or pastry cutter. Bake for approximately 8 minutes, rotate the pans and bake for another 8 minutes. Turn off the oven and prop the oven door open using an oven mitt. Crackers will crisp up while the oven cools. * We use La Tourangelle 100% organic and unrefined coconut oil. This is a great substitute for shortening, and has a neutral flavor and no trans fats. A levain is the portion of pre-ferment flour and water that goes into the final dough and raises the whole mass during the bulk (first) and final rises. To make a levain, you must first make a starter culture, which is essentially a mixture of flour, water, and ambient yeasts and bacteria, which under ideal conditions, will thrive and multiply. This is a 6-8 day process of taking a small amount of the flour and water mixture and adding more flour and water, until you have a strong active culture. Once you have an active starter, you again take a portion and “build” it with larger amounts of flour and water. After two builds, the levain should be ready. Any good artisan bread book will have a thorough explanation of this process. At Nana Cardoon we use two basic methods for building levain. One comes from an article in The Art of Eating publication: “A Recipe for Pain au Levain,” by James MacGuire. (Number 83, Winter 2009). In the same issue is an interesting article about the Poilane Bakery Pain au Levain. The second method we use is described in Tartine Bread by Chad Robertson. We also consult Flour, Water, Salt, Yeast by Ken Forkish.